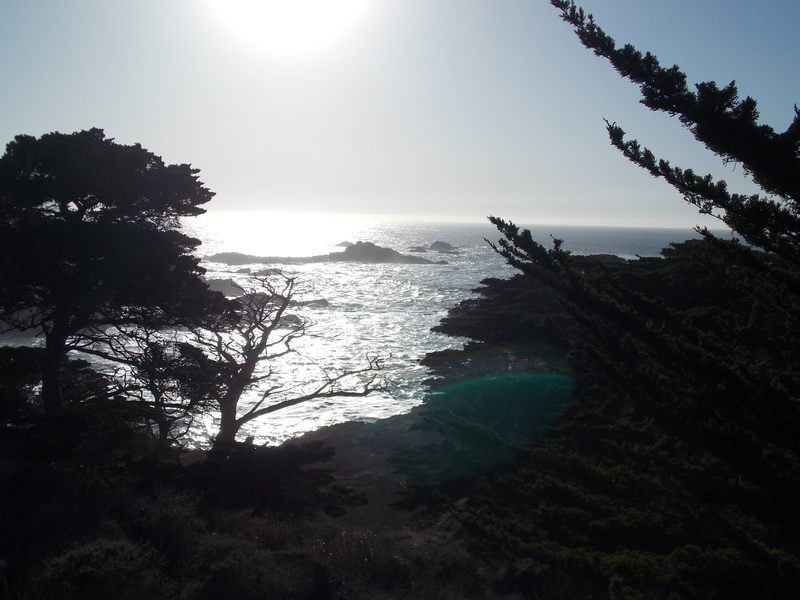 I’ve shared the following itinerary/email with countless friends driving up the coast of California (most recently Janet Lawler, author and keeper of the blog The Screenwriting Life), and I felt it was time to formalize my recommendations in a searchable post here. The article I published on campsites in Southern California has attracted a lot of readers, so maybe I’ll have the same luck with this one. My familiarity with Carmel/Big Sur (thanks to my parents who bought their first house in Carmel-by-the-Sea shortly after I graduated from UVA in 2001) far surpasses my knowledge of towns between the Monterey Peninsula and Santa Barbara (I hear San Luis Obispo has its charms), but frankly, and maybe I’m just biased, Big Sur and its Carmel environs are the most beautiful, and where I believe you ought to spend the majority of your time if you’re doing this breathtakingly stunning coastal drive. Upon leaving Los Angeles, you can take the long(er) way, Rt. 1, straight off the Santa Monica Freeway (Rt. 10) and drive through Malibu and Ventura Counties, before meeting up with 101N. Or you can take the 405N to the 101 (which is our preferred route) and you’ll see the coastline in Ventura, about 30 minutes south of Santa Barbara. Keep in mind if you do it right, with various stops along the way, it could take you a good seven to eight hours. Carpinteria is the first place I’d recommend stopping. You’ll find a small, sleepy beach town with one main drag. 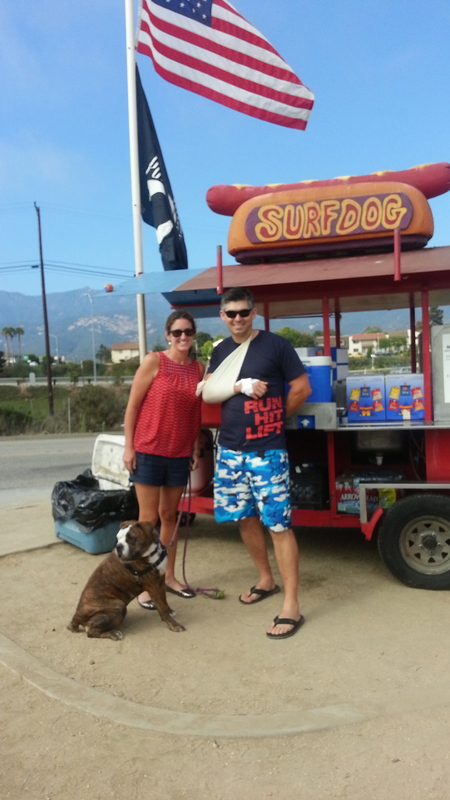 There’s a hot dog stand, aptly called Surf Dog, right off the highway if you need a snack. Also worth checking out, and you’ll want to limit yourself to one beer if you’re road-tripping, is the Island Brewing Company, along the train tracks. For dog-owners, there’s a small patch of beach towards the north side of town that is dog-friendly. 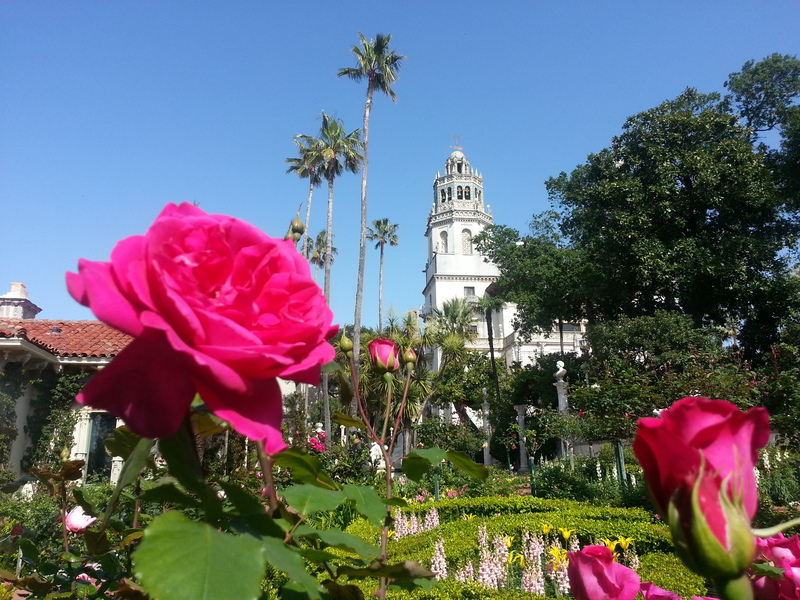 In between Carp and Santa Barbara is Montecito. We celebrated my parents 40th wedding anniversary this past year and ate dinner at the Stonehouse at the San Ysidro Ranch Inn. It is one of the most spectacular settings for a restaurant I’ve ever encountered. No wonder it’s frequented by many a Hollywood A-lister. Pismo Beach is another good place for a pit stop. We’ve never spent too much time here, but it seems like a funky little town. 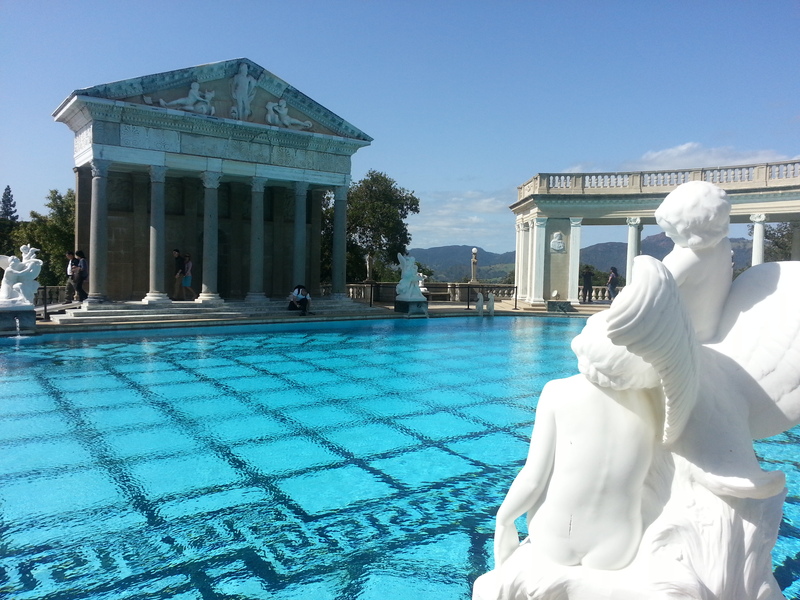 Your next stop should be just north of Cambria at Hearst Castle. I’d driven by the signs dozens of times, and it wasn’t until this past year before I got married that I stopped in with FoxyLady. We had a blast (for once, all photos in this post are mine). Keep in mind you MUST have a reservation. You can call the day of, typically, but I wouldn’t risk it if you’re here from out of state. We did the grand rooms tour, which is a quick 40-minute overview of the property, and after you’re free to wander the exquisite gardens. This is perfect if you still have a long drive ahead, but there are more thorough tours of the extravagant estate for diehard historians. Don’t forget to be on the lookout for zebras. 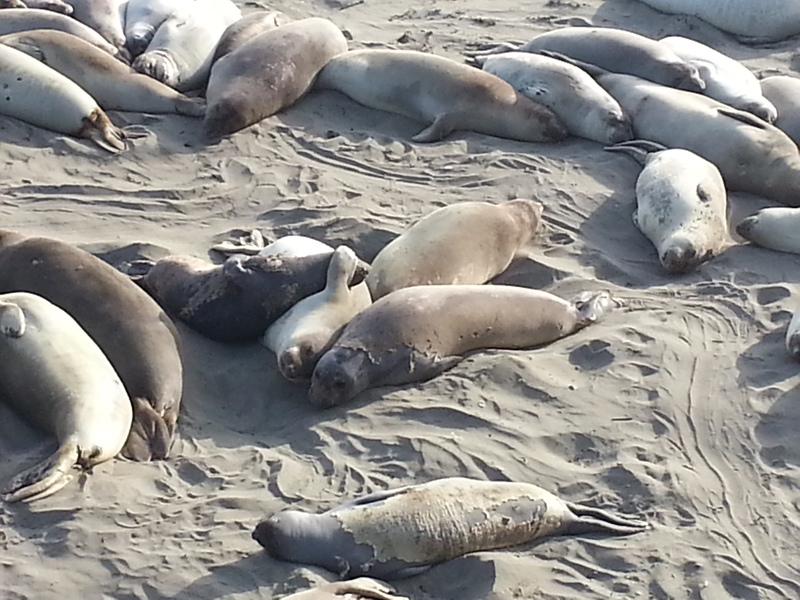 A few minutes north of Hearst is one of my family’s favorite stops: the elephant seal rookery/beach at Piedras Blancas. You can spend 15 minutes or you can spend hours here. There’s never a dull moment. Just be prepared, some of what you’ll see can be gruesome (the hefty males often squash pups to death just moving from one spot to the next). I like to walk as far north as the trail allows and sometimes you’ll find a deserted spot with several seals. Depending on what month it is, the beach will look like this below, while at peak times you won’t see an inch of sand. The rest of the drive to Big Sur speaks for itself. You may even recognize part of the winding, cliff-side road from the countless car commercials which have been filmed there. Make sure you have a full tank of gas and a full battery on your camera and you’ll be good to go. Binoculars couldn’t hurt either. If you hit the timing right you could see dozens of whale spouts (greys, humpbacks and even killer whales are known to migrate along the coastline). Among places to eat in Big Sur: Deetjen’s is a little ramshackle old log cabin of an inn/restaurant (built in 1937); Nepenthe, while a total tourist trap with marginal food, is worth stopping in for a drink or an appetizer to check out the spectacular views; and my family’s favorite is the Big Sur River Inn — with award-winning bloody Marys and wooden Adirondack chairs smack dab in the middle of the river that you can sit in. Ventana is another restaurant we enjoy, though on the fancier side (better to come here with a formal reservation for lunch or dinner than to stop in in road trip gear/bedhead). 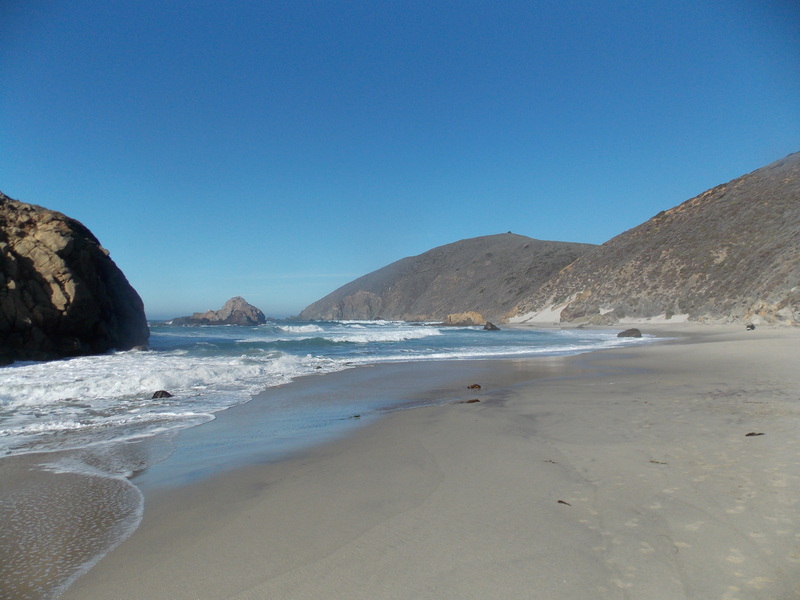 Somewhat of a hidden treasure in Big Sur is Pfeiffer Beach. It’s at the end of a long, windy road through the woods where you’ll feel like you’re off-roading on the set of “Lord of the Rings” or “Jurassic Park.” Just be patient. Two or three miles in you’ll come to a parking lot and when you emerge from the forest you’ll meet one of the most spectacular beaches in the world. Locals notoriously steal the signs from the road making it challenging for tourists to find. One of the last restaurants before you hit Carmel is the California Market, at the Highlands Inn (a Hyatt hotel). The views here are spectacular and every table on the patio is equipped with binoculars in case there are animal sightings. You can get breakfast, lunch and dinner here and all are delicious. They make a great mojito. 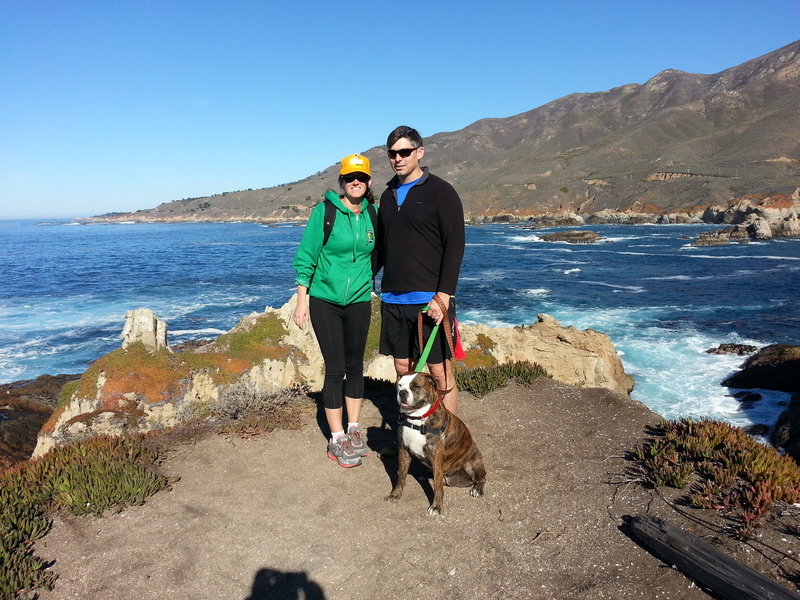 Just a few miles more and you’ll have reached Carmel. Take a left on Ocean Ave. and celebrate. You made it! The best welcome to town is grabbing a sandwich at Bruno’s or the 5th Avenue Deli (next to the Post Office) and picking up a coffee at the Carmel Coffee House. Park your car at the bottom of Ocean Ave. and either picnic on the Carmel Beach (look north to the Pebble Beach golf course and sprawling mansions) or walk along Scenic checking out the charming houses overlooking the ocean. In addition to recommending stops along the way to Carmel, I’m including in this portion of my post things to do in/around Carmel. See something here that you didn’t like or have any additions to this list? Please email me with your comments. La Playa Hotel is an attractive, welcoming hotel just off downtown Carmel where I used to wait tables. If the rooms here are pricy, there are several other B&Bs and small inns where you might find more reasonable rates. Check out hotels in Monterey, too, as they tend to be more affordable. Among my favorites is the Monterey Plaza Hotel that sits right on the water. 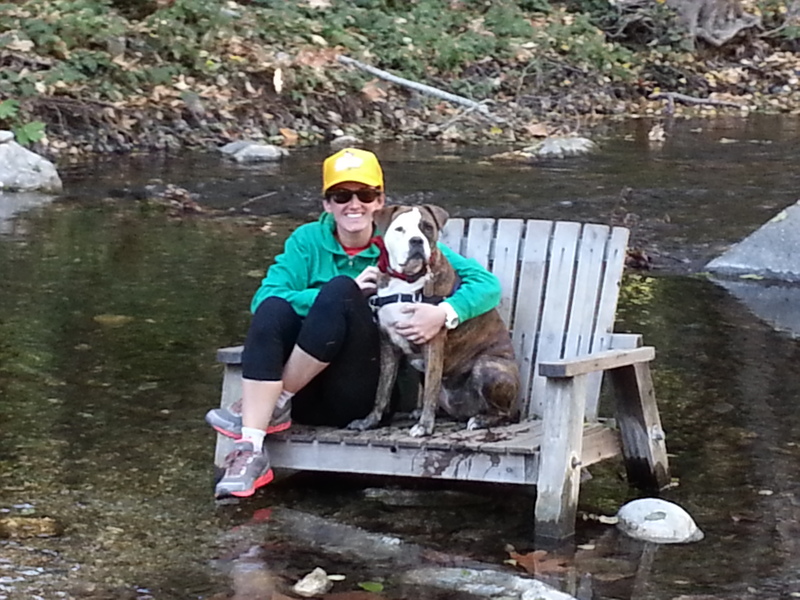 The Cypress Inn, owned by Doris Day, is a pet-friendly hotel. 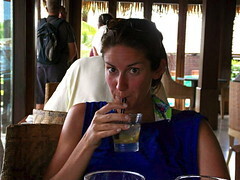 If you’re staying elsewhere, it’s worth a stop for food and drinks. Its happy/yappy hours are famous in town for puppy-watching (and people-watching). We always try to stop in here with Agnes. Club Jalapeno: They serve great Mexican here with fantastic margaritas (closed Tuesday for lunch). Katy’s Place: It’s an institution for breakfast in Carmel, though a little pricy. Il Fornaio: Yes, the chain, but it’s always a wonderful time with its boisterous atmosphere and quality Italian fare. Flying Fish Grill: Not sushi, necessarily, but a great spot for fresh fish, almost Asian fusion. Mission Ranch: Clint Eastwood (Dirty Harry used to be the former mayor of Carmel) bought the ranch in 1986 saving it from becoming a condo. It’s a favorite of locals and if you can carry a tune, you’ll want to stop in for their open mic performances. They are a HOOT. To this day, my brother is still waiting for my debut performance. Fandango Restaurant: This spot in Pacific Grove is a favorite of ours. We’ve enjoyed at least three holiday meals here. It’s not really Italian, it’s not really French, but it’s Mediterranean cuisine. Tons of atmosphere and great service always make for a special evening. Some others to consider: Forge in the Forest, Casanova, Little Napoli, Sea Harvest and Little Swiss Cafe. The 17-mile drive through Pebble Beach is an absolute must. Tourists end up paying about 8-$10 to pass the security checkpoint, but if you slow down and wave casually you might be able to pass for a resident. Otherwise, stop and tell them you’re grabbing a drink at the Tap Room and they’ll either charge you and you can get a refund with validation on the way out or they’ll just wave you through. The drive along the water is beautiful (don’t forget to pose by the Lone Cypress), but you’ll definitely want to get out, walk around and enjoy the lodge/shops, as well. Make sure you check the calendar before your visit. There are several events here every year, of the two most popular are the AT&T Pro-Am the first week in February and the Concours d’Elegance car show in mid-August. If those are of interest to you, great! The more the merrier. If you’re trying to avoid crowds, then choose another time to visit because town is mobbed those weekends. 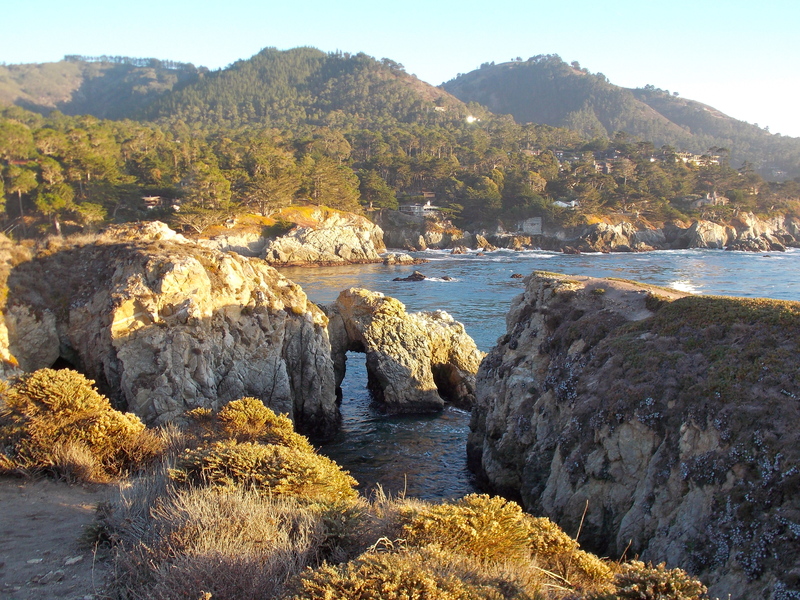 If you’re ready to get out of the car and get some exercise, head over to Point Lobos for a hike, or if you’re into SCUBA diving, paddling or kayaking they have those, as well (you just have to reserve your spot ahead of time). You can make the trip as short as a half-hour or as long as three hours. Park along Rt. 1 to avoid the parking fee — you’ll see the cars — and walk into the park where you’ll be climbing mountains and walking paths overlooking the ocean, waves and seals below. The round trip hike is roughly seven miles and can take at least three hours, so go prepared with a snack. Further down Rt. 1, back the direction you came from, is another favorite hike: Soberanes Canyon (east side of the street)/Soberanes Point Trail (ocean side). You can choose between a moderate forest hike on one side, or an easy ocean walk on the other, or if you’re feeling adventurous do both. Dogs are no longer allowed at all on Soberanes Canyon, unfortunately, but it seems they can go leashed on the Point side. The Monterey Bay Aquarium is a fun stop for the whole family. It’s generally always crowded, so make it a first stop of the day. They’re doing great things for education and conservation and the kids will certainly enjoy an up close encounter with an otter. If you’re in the area for a night or two, definitely go to the Inn at Spanish Bay around 4-4:30 p.m. (look up when sunset is) to hear their bagpiper. Sit around their massive stone, California firepits with blankets and a hot toddy and enjoy the sunset and music. My mom and I always get misty-eyed here. Even if you’re not religious, seeing the Carmel Mission can be awe-inspiring. It’s a beautiful church and one of Carmel’s most iconic landmarks. If you have some extra time check out some of the digs of some famous writers. The Steinbeck Museum in Salinas is a worthy stop, as is the Tor House of Robinson Jeffers along Scenic Drive in Carmel. In keeping with the Steinbeck theme, you’ll also want to check out Cannery Row in Monterey, though today it’s a bit heavy on the tchotchke-as-souvenir side. Thanks for reading. Stay tuned for future travel guides. Next up Sonoma! Hello! Love your trip! Just wanted to ask how you were able to do the Hearst tour with a dog? We’re thinking of doing a road trip down there and want to take our pup but don’t want to be limited in what we can do. thanks! Hi Katrina, thanks so much for reading and commenting!!!! Gosh, isn’t this terrible I don’t remember what we did with Agnes during the Hearst tour!!! I don’t typically leave her behind in the car, but maybe we did with the windows down and just went through it as quick as we could?? The weather must have been cool enough because I generally am not a fan of leaving her in the car… Sorry for no help. Hope you have a great trip!!! Love your post, it’s the most conclusive I’ve seen… and I have been searching!!! Looking forward to doing most things on your list this weekend!!! thank you.